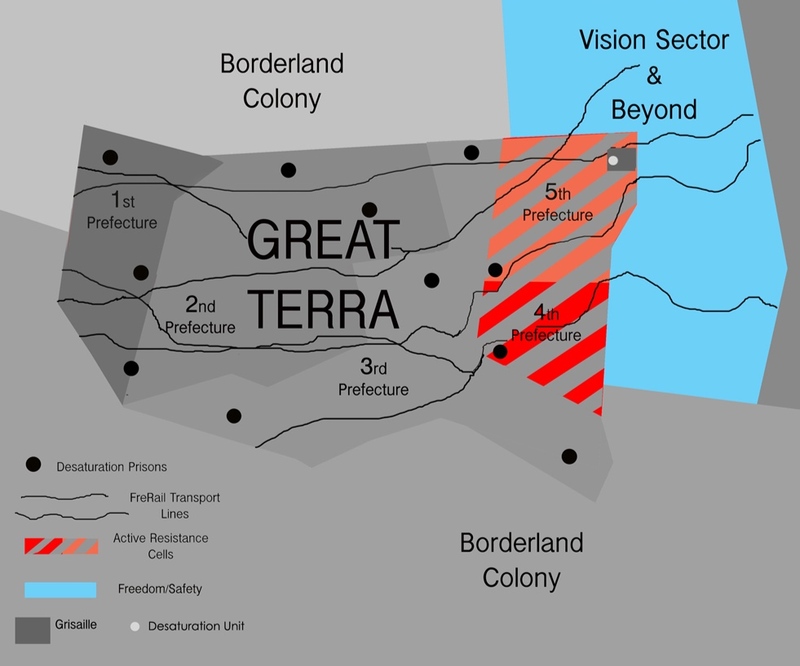 All of Great Terra is divided into 5 Prefectures. Just 6 years ago these Prefectures shared a common language and embraced a common culture. But demographic changes began to sweep over the land. That solidarity cracked, intolerance reigned, and calls for civil war threatened the country’s unity. Linked by hatred of all Color, Prefectures 2 and 3 joined forces, waged war, and prevailed, dominating Great Terra. Overnight the Junta transformed MagnifEyes from a free and open communications technology into a weaponized surveillance apparatus. Armed with masks, drones, MagnifEying glasses, floating balaclavas and eyeballs, MagnifEyes scanned the landscape 24-7, seizing those who defied the new rules outlawing any expression of Color. Color had once been enshrined in the law as a birthright that bestowed kindness, wonder, individuality, along with curiosity and the capacity to dream. Now, the Coalition has turned its attention eastward. Attempting to impose Great Repression regimes in Prefectures 4 and 5, it deploys MagnifEyes’ technology throughout Great Terra to capture those daring to express their individuality. These resisters are seized and transferred to desaturation compounds. Part of a desperate migration, Fugitive Colors use FreeRail Transport tracks to guide them north and east. Once a railroad network connecting all of Great Terra, these routes now direct Fugitives towards portals leading to safety. Resistance Cells of Fugitive Colors organize waypoints to provide food, shelter, and maps to safety. These maps, passed from cell to cell, mark the changes in blind spots, MagnifEyes’ Achilles heel. Following these blind spots, the Fugitive Colors make their escape through open portals to Vision Field and freedom.